This translation is not completely accurate as it was automatically generated by a computer. The Rev. 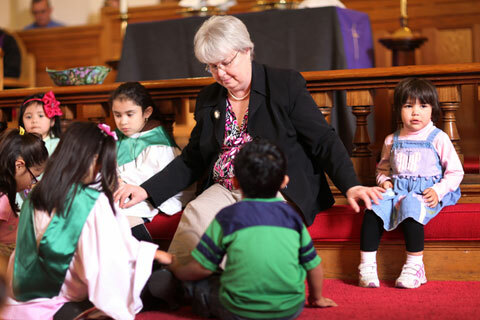 MaryJane Pierce Norton leads children’s time at West Nashville United Methodist Church in Nashville, Tenn. A UMNS photo by Kathleen Barry. When we join The United Methodist Church, we vow to support it with our prayers, presence, gifts, service and witness. Like so many of the promises we seek to live out as individuals, these begin with the promises of God. God’s presence surrounds us, and thus we find ourselves promising our presence as well. Seems like a little thing, doesn’t it? Just to be present? Throughout my lifetime, I’ve heard people scoff at the importance of presence. Yet, I in part find myself living out presence because of the witness I’ve had from others. If I close my eyes and think back many more years than I want to acknowledge, I can visualize the sanctuary at Central Avenue United Methodist Church in Batesville, Ark., and see exactly where certain members sat. In my mind’s eye, I can even see their movements during the service. Some turned and carried on active conversations with others around them. Some sat so attentive that they vibrated encouragement to the pastor and worship leaders. Some lovingly handled their hymnals not just to sing the hymns but also to thumb through during the service, pausing over those hymns with great meaning for them. I would like to argue that, most often unconsciously, these dear people were modeling for me during my childhood and teen years the ministry of presence. There wasn’t any reason for me really to interact with some of these adults at church. They weren’t my Sunday school teachers. They weren’t my youth leaders. They didn’t serve snacks at vacation Bible school. But they were people I saw in my small town. They were the librarians, the postal carriers, the neighbors down the street, the shopkeepers. I saw them and watched them as they carried on the daily tasks of life, and I saw them in the pews at church, worshipping God and participating in Christian community. One was a neighbor who lived up the street from us. I saw him mowing the lawn, playing with his boys and chatting with my parents. And I saw him, Sunday after Sunday, sitting in the second row from the front on the left side. A witness to presence. One was my Girl Scout leader. I don’t ever remember her actively teaching or working with us in the church, but year after year, starting with Brownies and moving forward, she planned activities and led us in Scouts. And she was there, Sunday after Sunday, sitting about three rows from the back, left side on the center aisle side. A witness to presence. One was my seventh-grade teacher. Long before I had her in seventh grade, I saw her in the hallways at our school. And I saw her every Sunday singing in the choir. A witness to presence. The linkage makes it such a wonderful witness. We see in the pews the people we see the rest of the week. Living a good life without a presence at church doesn’t allow us to reflect God’s love and care to the world. Being present on Sunday without living a good life doesn’t allow us to reflect God’s love and care. But together both form a powerful witness. Think of it in this way. In many congregations on Christmas Eve, we light candles and lift them. Without even one of those candles, the light of presence dims. And our witness is less. So, as congregations gather to observe Laity Sunday this week, think about the theme: Disciples Transforming the World: Through Presence. Don’t underestimate the witness of presence. Each light adds to the light of the next, witnessing to God’s presence surrounding us and our presence, one with another, mirroring God’s love and care. *The Rev. MaryJane Pierce Norton serves as associate general secretary for leadership ministries at the United Methodist Board of Discipleship. News media contact: Barbara Dunlap-Berg, Nashville, Tenn., (615) 742-5489 or newsdesk@umcom.org. Comments will be moderated. Please see our Comment Policy for more information. We're here to help you find assistance. Editors and other church communications leaders–get articles, graphics, and syndication tools, etc. This will not reach a local church, district or conference office. InfoServ* staff will answer your question, or direct it to someone who can provide information and/or resources. Your Spam Blocker might not recognize our email address. Add this address to your list of approved senders. Copyright © 2006 –2012 United Methodist News Service. to United Methodist News Service (or UMNS). .
Press ESC or click anywhere to exit.